The problem with releasing a map, is that it’s generally expected you work on another one right away. I only released BOB (Bridge Out Battle) 2 weeks ago and already people are wanting the next thing. But what do I tackle? I have done nearly all genres of maps now… and to make matters worse. I have no idea what direction I want to go next. I’m thinking about doing another quickly with a second Eronev Chronicle map. Those are fun and easy to do, plus they give me a chance to flex my diversity muscle another time and try experimental things I wouldn’t normally try on a full release. Right now I have 6 maps in my saves folder that I’ve started… some significantly older and in a worse state than others. One of them I haven’t touched since prototyping last October (yeah, 2012). I suppose it’s a matter of picking up which one will keep me interested until completion. This new website has given me an outlet to organize and share my complete map works with everyone which is awesome. But despite my best efforts, map making continues to be under the hobby category since the revenues I get from both my youtube and this website are barely enough to keep the website running. Which of course means map making will come second fiddle to my real job. So all you guys and girls wanting new maps now, and wondering why I haven’t uploaded a new map in over 2 weeks(!) remember that I’m only doing these in my spare time. That said, BOB is picking up steam thanks to Xisuma showcasing a game on his channel which you can see above. My POV of the same game is on my channel, I get a great view of the final battle. As well as another match I found online which proved to be quite entertaining. Anyway… it’s back to the drawing board. Hopefully I can get something out before Animal Crossing comes out… it is likely to consume me. Welcome to Bridge Out Battle, or BOB for short. This is a team based PVP map where 2 opposing teams must bridge out to the other side and wipe them out using a great deal of strategy and cunning before the temple destroys everyone. The temple, floating at the center, will slowly draw in power and the team that releases the power gains buffs for their team or debuffs for the opposing team as well as an ender pearl for quick travel. It has a lives based system, so even if you fall to your death, you can continue to play until all your lives are out. When a team loses all of their lives and players, the other team wins. This is my first attempt at a pvp map. Should be interesting to see how well it does! It was a lot of fun to build and couldn’t have been made without the help of texelelf’s filters (http://elemanser.com/filters.html) and vladimyr (http://www.youtube.com/sirvladimyr) who came up with the initial concept and contributed many ideas as well as his epic voice for the trailer. Huge thanks to all the beta testers who helped in the process of balancing and contributing many ideas. In roughly 24 hours I intend to release my newest map. It’s in the untested (for me) genre of maps PVP. Honestly, I don’t play a lot of PVP maps. Honestly, I don’t even really enjoy PVP maps. Why? Something about the repetitive nature of them. You do the same thing, over and over and over again. When I saw the below trailer, I immediately messaged vladimyr about doing a PVP map using the same mechanic. I thought it could change up the regular PVP formula a bit. Open up more options for strategy, more options, more options, more options. The concept is simple enough, catch falling blocks to build things to attack the other team. But try doing that while under arrow fire, will you build a fortress, or will you return the fire? Will you use your blocks to create potions or will you save up enough cash to go for villagers? What the hell is that thing in the center for? Anyway I digress. The whole point of this post was supposed to be that map releases are terrifying. I am always on edge before I release any of my maps. What if it’s a failure <- always the first thought. Well what IF it’s a failure? Does it really matter? Am I any less of a creator if it is? Not everything can be a huge success like Eronev 1 or City of Love. The other thing to consider is audience? Right now there are 3 groups of people who want certain things from me as a content creator. One team, wants Eronev 3. One team wants Adventure Multiplex 2. And just recently, a new team want’s City of Love 2, or City of Crimes, or City of Hate… or something. let’s not even talk about the ones that want more youtube content, or BRF to return. Nobody asked for a PVP map. Why did I make it? Who will want it? I made it because as I do with anything, I create things that are new and exciting for me to build. Rehashing the same thing over and over is NOT fun. Could I build an Eronev 3 that is functional, uses cool mechanics and finish the story that’s in my head? Probably. But the heart wouldn’t be there. I don’t have a burning desire because I havn’t found the “hook” that will drive it. The hook is also the thing that drives me. The new thing that makes each of my maps completely different from the one before it. My new map: Bridge Out Battle, or BOB for short, will be released in around 24 hours from now. I do hope you enjoy it, and if not, at least I enjoyed building it. Side note: I added 2 of my oldest maps on the map list, Lava Dungeon Survival and Sandstone Tomb with Pistons. They’re not great, but I made them, so they should be there. They were also exciting to build. Both of them inspired an Eronev map, so there is that. City of Love is a Success! Wow, City of Love just cracked 200,000 downloads. That’s always an impressive milestone and is quickly becoming my most downloaded map. It still has a little while to catch Eronev Mansion Adventure, but I have no doubt it will catch it within the month. That’s such a crazy high number in such a small amount of time. People want a City of Love 2 but I feel like if exactly the same thing was made it would diminish it somewhat so it’s a matter of finding a balance of new vs old. But at the same time, I have a hard time making sequels that aren’t completely different from the map preceding it. New is always more exciting than rehashed. Anyway I could never have made City of Love without the help of the awesome people who made it possible. Faume spent almost as much time as me tolling away on the redstone and testing and retesting mechanics and ideas. Without rsmalec and vladimyr we would never have been able to come up with such diverse and interesting characters and their building and texture work was key to City of Love. If you have played superheroes, the city-scape might look familiar… very familiar. And the church was a vlad construction late one night, I was tired and was starting to give up hope that this map would ever get finished. Him building the church was the ray of sunshine guiding us to the end. And Nirgalbunny was the brains behind the original concept for the dialogue tree. It’s gone through many revisions since then but without that first idea with the levels, and jumping around different sections, this map wouldn’t have been made possible. Also the people that are disgusted by the barkeep? You’re lucky she didn’t turn out like Nirgalbunny’s original plan. Maybe we’ll leave that a secret for now. Of course there are many others this map is much better for, KupoKupo for work with the texturepack and the main street and of course texelelf whose filters made this map be possible to come out now and not a year from now. His filters saved us a mountain of work. As well as Abrightmoore whose tools have been super handy. So what’s next? 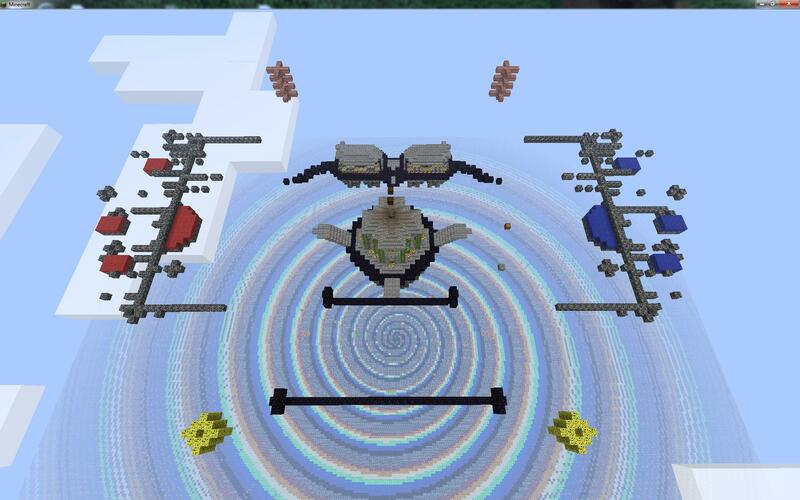 My PVP map is almost done. I’m still running test games and balancing it. I have an idea for my next major adventure map with an interesting mechanic and I am hoping to release a few smaller maps in the mean time while still keeping this page updated. I still want to add and update my legacy maps “My First Map: Piston Dungeon” and “Lava Survival Dungeon” despite how bad they both are. Also the seedlings of a few collaborations, but those are probably a long ways off. Maybe a few extra shirt designs for the few that might be interested… to be honest I’m mainly making them for me but I figure some people might want one so they’re available and I’ll post here when new designs are up.